Grooming your dog isn’t a luxury, it’s a necessity. Keeping your four legged best friend well-groomed isn’t just going to make them more pleasant to be around, who really wants to cuddle with a pup that’s been rolling around in the dirt and smells bad? It also helps keep your dog more comfortable and allows you to catch potential health problems before they become something more serious and dangerous. When your dog is properly groomed, meaning their coat is brushed nicely and their nails are trimmed, they are going to comfortable. Think about your own body. If you’re wearing a hat that is too tight or your clothes are a bit snug, it’s going to be uncomfortable and you’re going to take the offending garment off. Now, just imagine that same discomfort all over your body and you cannot take it off. That’s how your dog will feel when their coat is ungroomed and knotted. If you have a short-haired dog, this is going to be much simpler than caring for a long haired dog, it’s going to be a bit more complicated. You may not think that there is anything special about bathing and brushing your dog, but when you know the proper techniques and have the proper dog grooming supplies, you can greatly enhance the effectiveness of the process. It is important that before you bathe your p﻿﻿﻿﻿up, you give him a good brushing. You’ll want to choose the best dog grooming brush that is designed for their coat. For example, you don’t want to use a brush designed for short haired dogs on your collie, nor would you want to use a brush for long haired dogs on your miniature pinscher. When you thoroughly brush your dog’s hair, you are going to be able to remove the loose hair and it’ll improve the effectiveness of the cleanser to get through the hair and to the skin. Also, by brushing the hair beforehand, you aren’t going to have a bunch of hair left over after the bathing process. As you’re brushing, you will want to start at the head and work towards your dog’s tail. You are going to want to be gentle, but apply enough pressure to remove the fur. You aren’t going to want to rip through knots because it’s going to hurt your pup and make then not trust you and loath being brushed. While you’re brushing, this is the key time to look for any lumps, sore spots, or ticks. If you spot any ticks, remove them, and take not of the lumps or sore spots and watch them over the next few days for any changes. If they do get worse, make an appointment to see your vet sooner rather than later. After the brushing process is complete and you’re ready to give Fido a bath, choose a shampoo that will allow you to bathe your dog more than once a month without causing an allergic reaction or damaging their coat. Apply an ophthalmic ointment around their eyes to protect them and insert cotton balls in the ear canal so water doesn’t get in the ears. Look for a shampoo that is made for your dog’s coat type. You don’t want to use a shampoo that is made for your hair because they have stronger ingredients and it could damage their skin or fur. To wash your dog, thoroughly soak your dog’s coat with warm water and apply enough shampoo to create a good lather. Start from their head and work your way down to the tail, massaging the shampoo into the skin. You will want to pay attention to the groin area, in between their toes and in the armpits. 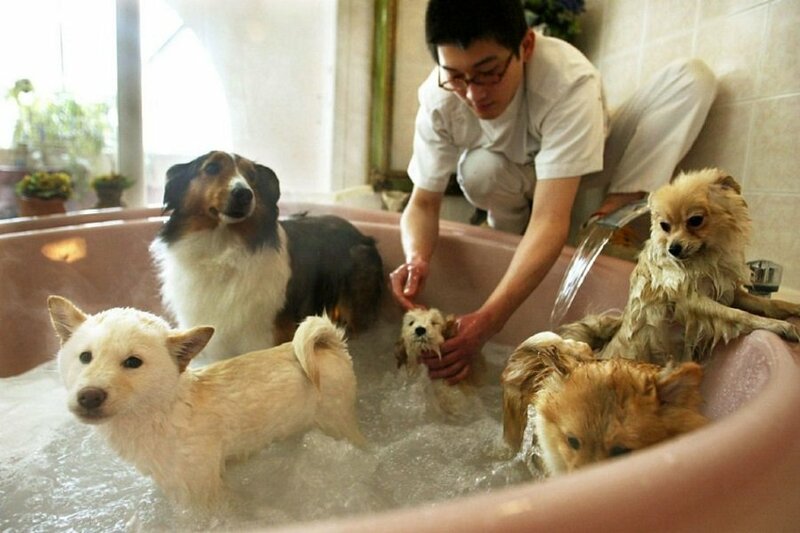 Rinse your dog thoroughly, making sure to remove all the shampoo. To dry your dog, you will want to squeeze as much excess water from their coat as you can. If you’re dog has short hair, use an absorbent towel and rub them vigorously to get the water out. 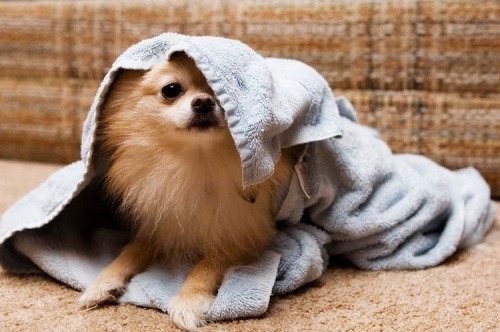 If you have a long haired dog, you are going to want to pat them down with the towel very carefully so that you don’t create more knots. Take a comb and gently comb through their hair. As they are drying, you’re going to want to keep them warm and inside until they are fully dry. There’s nothing worse than having a clean dog with damp hair go outside, even if to go to the bathroom, and come back dirty again. Damp hair is going to act like a magnet for dirt! 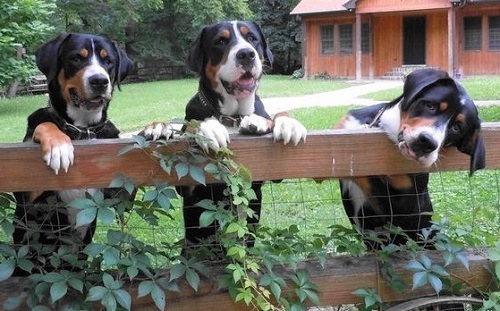 After you brush and bathe your dog, you’re going to want to reach for your nail clippers. 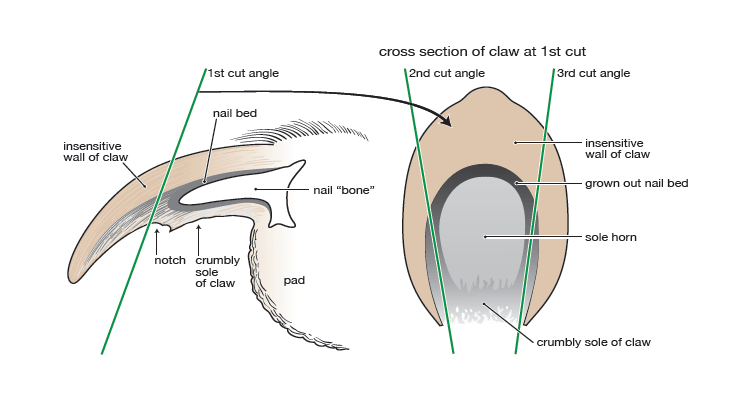 Unfortunately, domestic dogs need their nails trimmed regularly because their nails continue to grow. In the past, wild dogs would wear down their nails naturally by traveling over various types of terrain and hunting. But, since we’ve domesticated dogs, their environments have changed dramatically and they need us to trim the nails for them. If the nails are left untrimmed, they could get too long, which could lead to chipping and breakages. These can cause painful conditions that require the veterinarian to take a look at them. Also, while your dog is outside, they could easily tear their nails if they are too long. On top of the potential risk of the nail breaking or being torn, nails that are too long could cause so much discomfort, you pup may not even want to stand or walk. There have been extreme situations where the nails become so long, they start to curl under and dig into your dog’s paws! 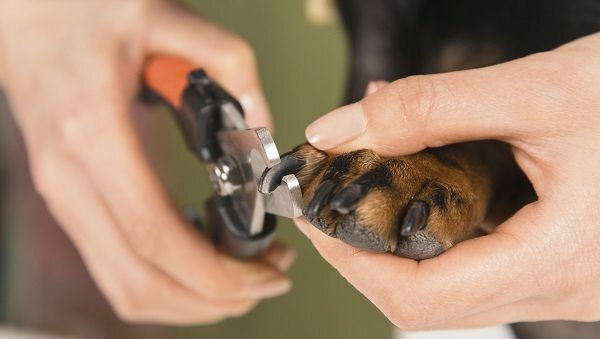 There are two ways you could trim your dog’s nails: clippers and a dremel. The clippers actually cuts the nail, whereas the dremel will grind away the nail. It’s important that when you do go to trim your dog’s nails, you do only a little bit at a time and don’t go too short, as they have a thing called “quick” in the nail. This is where the blood vessels and nerve endings are and if the quick is cut, your dog could start bleeding and that’s a whole other problem. If you’re afraid to cut your dog’s nails, you can always ask your vet or go to a groomer. Now that we’ve discussed the importance of keeping your dog’s coat well-groomed and their nails trimmed, let’s take a look at some products that we’ve found work the best at their respective duties. We are going to be discussing what we feel are the best dog grooming sets, best nail clippers, best deshedding tool and the best trimmer. Of all of the dog grooming sets there are on the market today, we feel that the Wahl grooming kit is the best professional dog grooming clippers for short to medium hair because it comes with everything that you need to give your pup a clean trim without having to go to the groomer. This clipper set is built to give you maximum performance, thanks to the advanced, patented motor that provides ample supply of power and speed without creating too much noise or extra heat. Customers said they loved how powerful the clippers are. They like that they are pretty solid and they feel good to hold. Customers have said that it runs much quieter than professional models, which is a plus if your dog doesn’t like loud noises. One customer said that these clippers were able to get through matted fur really easily, so imagine what it can do with unmated fur! The common complaint was that their unit got very hot shortly after using it, which caused them to have to turn the clippers off and use the scissors (which were included) to trim their dog’s hair. Other customers said the clippers didn’t work after the first time they used the product and oiled the razors, much to their disappointment. 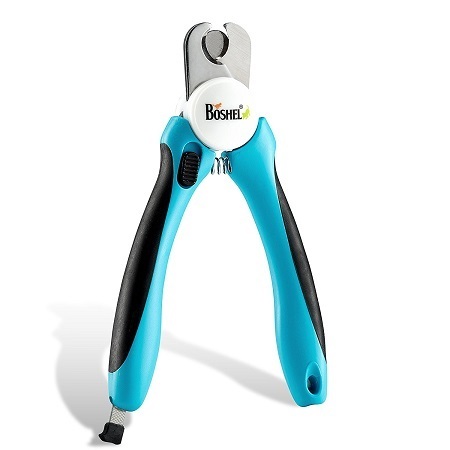 There are a lot of nail clippers for dogs available on the market, but we believe that Boshel’s Dog Nail Clippers are one of the best dog nail clippers on the market right now. The nail clippers are built to give you a professional quality clipping without spending any money. Ergonomic handles with a unique design ensures perfect results, even by firstimers. Customers said they love that these clippers have a small nail guard to prevent instances of cutting the nail too short. People have said that even dogs who didn’t like going to the groomer didn’t put too up too much of a fight when they had their nails clipped with these clippers. The like that these clippers are nice and sharp, and they stay sharp after numerous uses. The common complaint was these nail clippers were hard for them to use. One customer even said their dog’s nails shattered instead of cut. They also commented that the nail file that is included with this set is pretty worthless because it is too small and flimsy. When winter is over and your dog begins to shed, you’re going to want to do whatever you can to get ahead of the fur tumbleweeds as soon as you can. That is where the FURminator deShedding Tool for dogs comes into play. Though this probably isn’t what you would consider as the best dog grooming brush, it certainly can help you manage the shedding fur with little effort. Customers said this product is a “godsend!” Customers have said that their dogs are big time shedders and they are always needing to vacuum, regardless of how often they brush them. 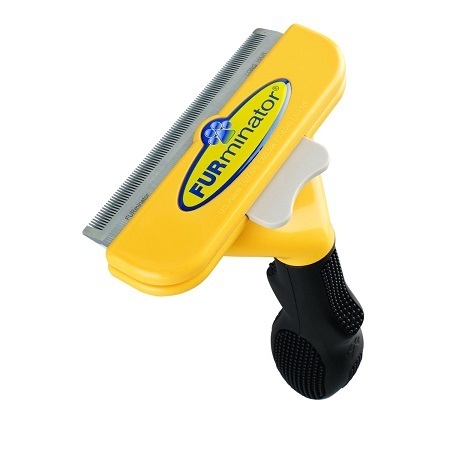 With this, customers said they can use the FURminator twice a week and it has held significantly. 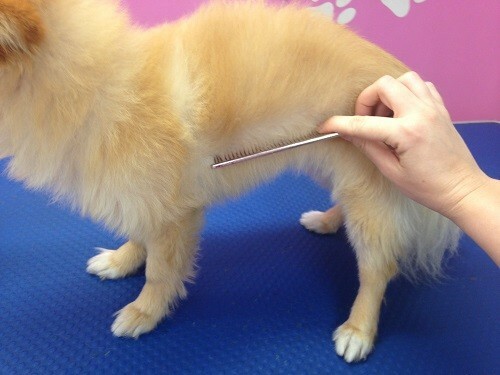 When it comes to actually combing their dogs, customers said their pets relax and actually enjoy the process. When they (the people) are done with the combing process, they are amazed by how much fur comes off their dog every time. The common complaint was that they received a counterfeit FURminator. Some people have gone so far to purchase a product from a pet supply store to compare. It’s hard to say if all of the negative comments are because they received a fake product. However, since only 9% have had complaints, we can safely assume that the matter has been taken care of. If you’ve got a dog with long, thick fur, you’re going to want to get a best cordless dog grooming clippers that are designed specifically for long haired dogs. That is where the Maxshop Low Noise Rechargeable Cordless Pet Clippers comes into play. What’s cool about these clippers is that they can trim the fur of a German Shepherd or a Himalayan with ease, but you can also use them on your husband’s hair too. Though, you may get some resistance from him if you try. It is recommended that you use the scissors that are included to trim the hair so that it doesn’t get clogged in the device. 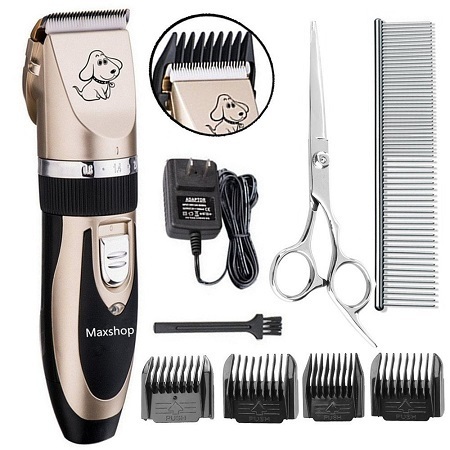 Customers said that because these clippers create no vibration and a gentle hum instead of the obnoxious buzz like with other clippers, they are able to give their dogs a trim without any problems. People like that they are able to clip their dog’s hair whenever they need a touch up instead of going to the groomer and spending a sizable amount of money. The common complaint was that the trimmer got clogged pretty quickly, which made the whole clipping process much longer because they had to stop and clean out the device. Some people have also said that when you put these in cordless mode (which is a big drawing point of the product), it loses some of its power and it doesn’t work as well as when it is being used with the cord. With the proper dog grooming supplies, you can keep your dog looking fresh and neat. But these tools aren’t just necessary for vanity’s sake—they are important for the overall health and wellbeing of your pup. With fur that is knotted and matted, you aren’t going to be able to see any bumps, lumps, and other problems, which could lead to life threatening diseases. With nails that are too long, they could make it uncomfortable for your dog to stand or walk. If you let them go too long, they could crack and break, which will force you to go to the vet for some help. Heaven forbid they get too long where they curl under and start digging into the pads of their paw! If you own a dog, make sure you have the proper dog grooming supplies so that they can continue being the happy and healthy pups that you love to snuggle with!